Zante (a beautiful island in the Ionian sea) where teachers have embraced values education for quite a few years now and where we held an International LV Conference on 3rd July 2014. On 3rd July 2018, there was an event at Xenopoulios Library in Zante where Anda Katsaitou, Anna-Maria Liveri, Peter Williams and Areti Foufopoulou presented Living Values Education activities. As special guests we had four teachers from Kefalonia (a neighboring Ionian island) who came to Zante in order to present their extraordinary work with Green values. 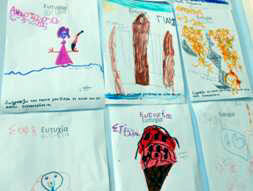 More specifically, being inspired by the first Living Values Education book and having attended a Living Values Education workshop in Kefalonia (held by Areti Foufopoulou in January 2018), they sensitized their students in regard with the respect and care for stray animals and the issue of caretta-caretta turtle (which is a protected species both in Kefalonia and Zante). 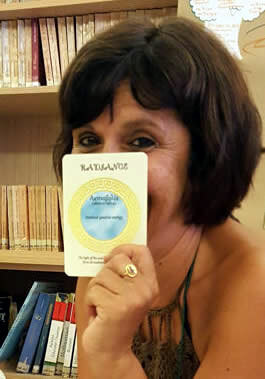 Areti Foufopoulou, one of Greece’s active LVE trainers and leaders, shares: “I am grateful to Eleni Kosmetatou, the kindergarten public school consultant for the Ionian Islands of Greece. She was introduced to me by Anda Katsaitou, who has been working with Values Education for more than five years on the island of Zante and who played a key role in the organization of the LVE Conference in July 2014 in Zante. My contact with Eleni resulted in her interest in promoting values activities on the island of Kefalonia. We agreed on the organization of a workshop for kindergarten teachers on 18th December. All the kindergarten schools in Kefalonia closed for the day so that 52 kindergarten teachers could attend the workshop, a beautiful display of true enthusiasm and interest in promoting values in their environment. Discussion, questions and the facilitation of activities from the ‘Living Values Activities for Children Ages 3–7’ book took place along with a presentation of LVE philosophy for four and a half hours. The LVAC 3–7 book was sent to them electronically and it was agreed that was those applying the LVE methodology and facilitating LV activities in their class/school, could join us at the Zante Conference in July 2018. 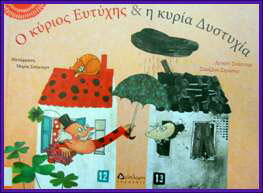 2010 saw the release of a book of activities, written in Greek, in response to requests from teachers at our workshops. This is now in its second printing. 2012 through 2014, we did the Grundtvig (EEU) project with six partner countries, CONGENIAL (Connecting Generations) which culminated in the production of an open source ebook of our methodology. In 2014, we participated in the Clean Water Challenge, also with Students Rebuild. In 2015, an offshoot of the Connecting Generations project resulted in a second book, ‘Love Stories’, both in printed and ebook formats. This was the product of a multi-class project, entirely created by students documenting interviews of their grandparents via audio, video and photography. In November 2015, we also did various local projects in support of Syrian refugees, in response to the refugee crisis in Greece. That same year, we took part in Students Rebuild Healing Classrooms pinwheel project. In July 2017, Living Values Education was delighted to be hosted in three unique and amazing locations that beautifully captured the warmth of hospitality and spirit of the Greek people. They say that a picture speaks a thousand words. On this occasion, perhaps it would be more appropriate to say that a picture speaks 2000 words! 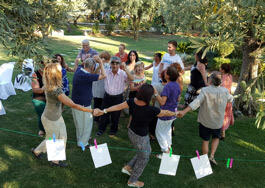 Mr Yannis Anastasiou kindly hosted two evening seminars for local Pilion region educators in his beautiful garden. Our host Mr Yannis Anastasiou expressing the values of truth and friendship with his wife, co-organiser Mr Yannis Filtris, co-facilitator Ioanna Vasileiadou and the Pilion Poet. The ‘Baking of the World cake’ from the Peace Unit of the “Living Values Activities for Children Ages 8-14” book. This activity, joyfully experienced by the educators, shows them forming the shape of a circular baking tin with the values ingredients gently cooking on the inside. The moral: All values are important. The clothes line in the foreground – strung between two trees – shows our wishes and hopes for a better world. Both activities are easily transferable to the classroom. A deep discussion facilitated by special guest Marlies Ludding van Loon, ALIVE Associate member for the Netherlands, illustrating what can be practically achieved through Living Values Education in Holland. The reference to helping refugee children touched many hearts as Greece is currently caring for many refugees. Three moments from the seminar ending with the value of story time and silent reflection as the full moon rose. Axion Esti is a totally unique ‘Arts School’ that is eco-friendly and architecturally superb. Created by the visionary owner, Ms Glikeria, and the equally visionary architect, Mr Dimitris Phillippitzis, the school encapsulates and ‘lives’ and ‘emerges’, amongst others, a welcoming and positive emotional culture in an atmosphere where everyone feels loved, valued, respected, understood and safe. The seminar for a youthful group of dedicated educators began with a mini practical activity to discover ‘Who’s values are these?’ followed by a range of trust activities with humor and light-heartedness. These three photos reflect the joy of these activities. One of the highlights of the evening was ‘Story Time’ and ‘Quiet Reflection’ in the school’s outdoor amphitheatre followed by a group photo. These three photos first show Mr Dimitris leading the group into the amphitheatre where stories were shared, the group photo was taken and the evening sun brought the evening to a close. These pictures truly express more than what 2000 words can say. 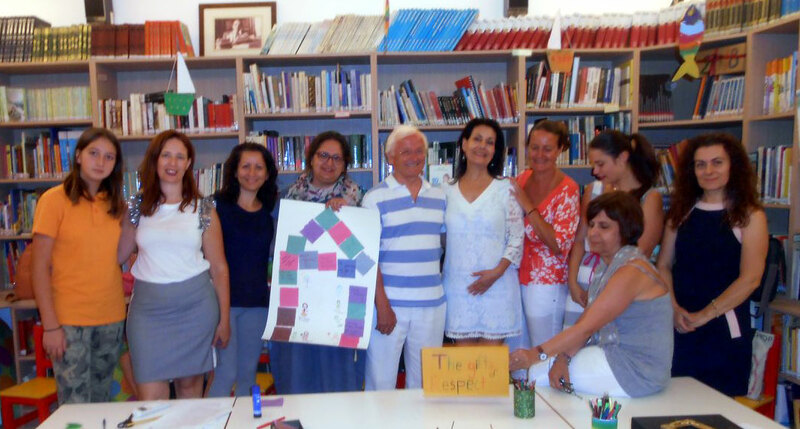 An important meeting – workshop on ‘Values of Life in Education’ was organized by the Association of Friends of the Children’s Library of Xenopoulouli at its premises. 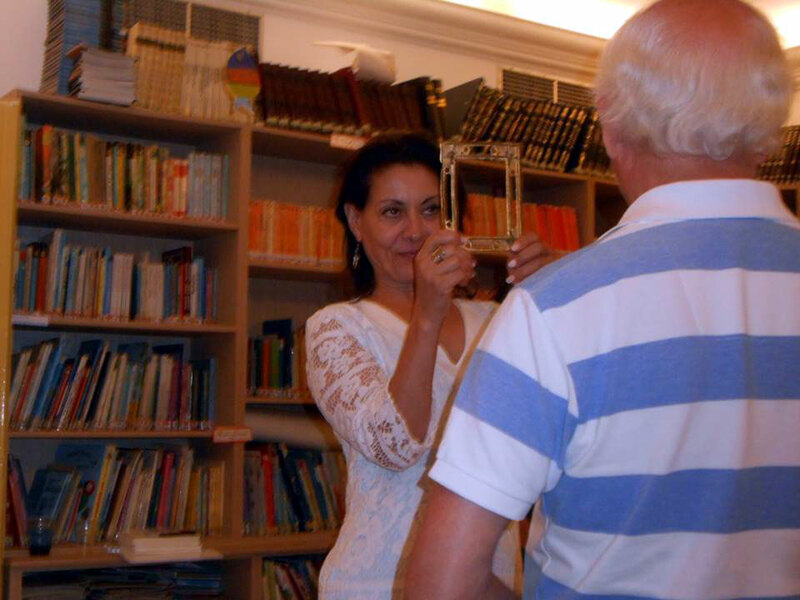 Through this event, friends, teachers and participants of the International Conference held in Zakynthos in July 2014, reunited to include the current President of the Association for Living Values Education International, Mr Christopher Drake, who came from Hong Kong, Vice President, Areti Foufopoulou, and former President and lover of the Greek spirit, Peter Williams. 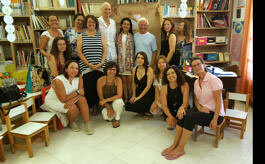 After a presentation by members of the Association of Friends of the Xenopoulouli Children’s Library of Values, which this year emerged through books and corresponding actions, it became an experiential workshop for adults on the subject of the universality of love. Group photo taken in the library. 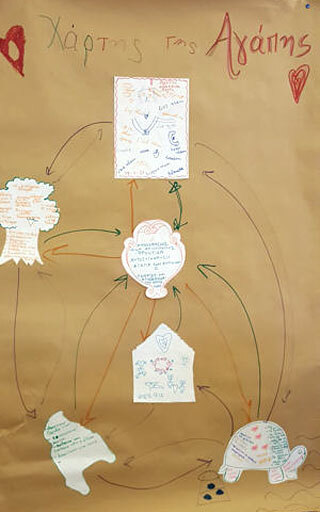 These show the ‘Universality of Love’ activity in action. This illustrates the result of the activity. Six different shapes were given to pairs of participants to represent a house, a mirror, a tree, a rectangular piece of paper to draw a body, the island shape and a turtle (to represent the protected species on the island). The participants were invited to illustrate or write what that illustration meant to them. Once completed, the images and words were shared then glued onto a large sheet of paper. Once all illustrations and words were complete – it was discovered that we all see love in different ways and we are all connected. The Moral: Love is Universal. The workshop ended with the signing of Peter’s ‘Ancient Wisdom for Modern Times’ books, translated from English into Greek by Aggeliki Palatzidi. What is totally unique about the library is that it is run entirely by volunteers, most of whom are mothers. Their dedication and practical example for others to follow, has brought many to their doors – especially children – to learn more about values, Greek myths, legends and how to live a life of values. Living Values Education would like to extend our appreciation to them all, their key person, Ms Anda Katsaitou, and everyone who gives tirelessly from their heart with love. Special thanks, too, to Areti Foufopoulou, Aggeliki Palatzidi and Yannis Filtis who organized all the logistics of the Lehonia and Volos programs – and Anda Katsaitou who organized the Zakynthos event – with their ever professionalism, kindness and altruistic joy. “The LVE programme inspired us as teachers to choose our personal, social, moral and spiritual values and to learn how to develop them practically,” reported Sofia Livaditi, an educator who teaches kindergarten on the island of Skyros. “It also helped us approach education as a way of offering students a philosophy of life which enhances their general development, education and choices so that they will enter the community with respect, self-confidence and a sense of purpose. The programme ran from October 2014 to the end of the school year in June 2015. We believe that our values programme helped children develop basic skills such as the ability to communicate effectively and to think with creativity and discernment. It also contributed to their sense of personal identity and autonomy as well as to their acquisition of social skills. We also feel that we helped the children develop metacognitive strategies by announcing their conclusions to the team, telling the stories behind their paintings, expressing the difficulties they had faced in certain activities, asking questions and through self-evaluation. The children's communicative skills grew through the sharing of their thoughts, emotions and ideas, discussions with the whole class, theatre, painting and team work. They explored imaginative worlds by acting in plays, inventing symbols and writing messages in the videos that we created of their work. 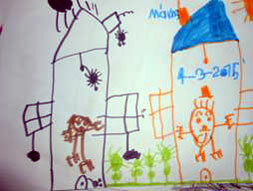 Their thinking processes were enhanced through speaking, writing, painting, movement and theatre. “We asked the parents for their cooperation and they responded well. Some helped to transform the school playground. Others painted beautiful pictures on the walls and paved the front part. They made videos of our school celebrations, helped each other and exchanged material. They worked with us to decorate our classrooms. They created their own website where they exchanged opinions and ideas, often posting activities from a list of games provided by the school. 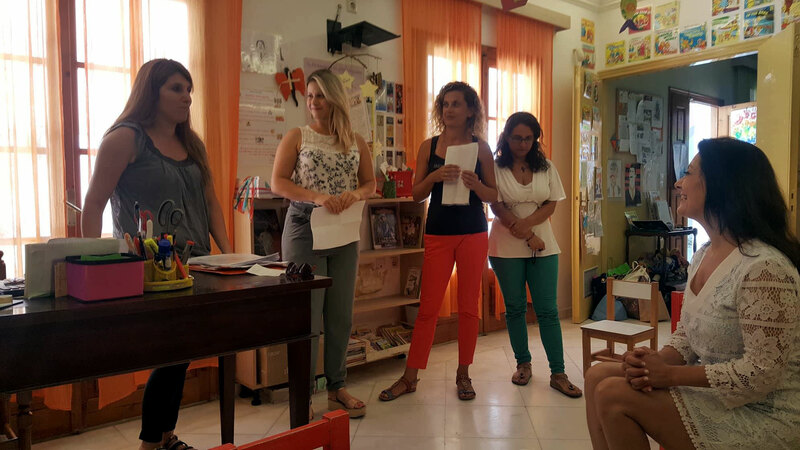 Anda Katsaitoy, a kindergarten teacher on the island of Zante, shared some of the LVE Activities they have been doing in the last few months. Many of the activities are from the “Living Values Activities for Children Ages 3 to 7” book, while others are creative and cultural additions. You may wish to add some of Anda’s ideas to your program! We played the mirror game, We formed a circle and each of us, individually, went to a nearby room where she / he met a very special and unique person : her / himself! Holding hands, we all sang the LVE song together: "Each of us is beautiful." We made a circle and each of us mentioned two things she / he is good at. In the same circle we mentioned one special quality about the person next to us. The lower part was divided into three sections with ribbons connecting them to the upper part. We wrote or painted on two pieces of heavy paper two things that we like about ourselves. On a third paper we wrote one thing / quality that we like about our partner. We offered it to our partner, who then attached it to her / his own construction. Finally, we made a heart with the intention of offering it to the one we love most!!! The meaning of happiness: I am happy when I see others being happy, I am happy when my friends love me, when I play with my friends. We went on with the book, asking. "What do you feel? Happiness or Unhappiness?" We discussed this and realized that someone may be happy with very few, simple things. We also searched literature for stories with happy ends such as Snow White and Greek fairytales. Finally, we talked about happy moments in the library!! We also mentioned other moments and activities of the library by the sea!! 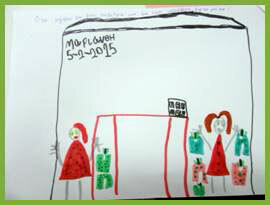 Then we painted cards showing our happy moments and put them in the "Happy Box" of the library. We left them there to remind us…. Anda Katsaitou, an LVE teacher on the island of Zante, shared some of the activities she has been doing with her kindergarten class. Ms. Katsaitou keeps a folder for values work at school. 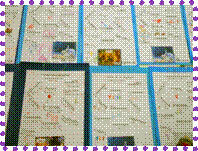 She wrote, via a translation by Areti Foufopoulou, “Every time that the students complete activities for each value, we gather children’s work in one smaller folder for each value in preparation for a presentation during programmed parents’ meetings. In January we explored respect. “We started with the question, ‘What is respect?’ Respect is too listen to others carefully. We played a game with a microphone. Each student took turns singing his or her favourite song and the others applauded or did not listen at all…. What were the feelings of the singer? Respect is to treat people, friends and animals well. Respect is to know that each one is unique and important, to appreciate ourselves and to help our friends at school. While listening to soft music, we showed what we could do with our hands: caress, play an instrument, greet others, paint, embrace and send a kiss. Then, we all painted as a team ‘I make good things with my little hands’ and each child shared his/her idea after forming his/her palm on the paper. 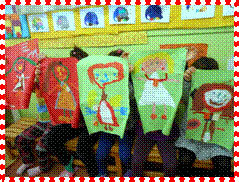 We also read the fairy tale ‘Elmer the colorful elephant’ and pointed out that each one is unique, so afterwards each child painted the self who was different from the others. Next, after discussing everyone’s strong points/qualities, we placed them on a necklace. Students went on to work in pairs and say a good word for their partners. We wrote down the word ‘respect’ and painted it. We have formed a corner of values in the classroom where we add one more value every time we deal with it. We also made a values calendar for the new year and each child was offered a copy for their family. Να ακούμε με προσοχή τους άλλους(παίξαμε το παιχνίδι με το μικρόφωνο, καθένας τραγουδούσε ένα αγαπημένο του τραγούδι και οι υπόλοιποι τον χειροκροτούσαν ή δεν τον άκουγαν καθόλου..ποία είναι τα συναισθήματα? Να συμπεριφερόμαστε καλά στους ανθρώπους, στους φίλους μας και στα ζώα. Να γνωρίζουμε ότι ο καθένας μας είναι μοναδικός και αξιόλογος. Να εκτιμούμε τους εαυτούς μας. Να βοηθάμε τους φίλους μας στο σχολείο. Με απαλή μουσική αναπαραστήσαμε τι μπορούμε να κάνουμε με τα χέρια μας( να χαϊδέψουμε, να παίξουμε μουσικό όργανο, να χαιρετίσουμε, να ζωγραφίσουμε, να αγκαλιάσουμε, να στείλουμε ένα φιλί). Μετά ζωγραφίσαμε μια ομαδική ζωγραφιά με το τίτλο «με τα μικρά μου χέρια κάνω καλά πράγματα» και το κάθε παιδί είπε την ιδέα του αφού σχημάτισε τη παλάμη του. Από τη πλευρά της λογοτεχνίας διαβάσαμε το παραμύθι «Ελμερ ο παρδαλός ελέφαντας» και διαπιστώσαμε για μια ακόμη φορά ότι ο καθένας είναι μοναδικός, για αυτό και στη συνέχεια το κάθε παιδί ζωγράφισε τον εαυτό του (όπου ήταν και διαφορετικός με τον άλλο) και στη συνέχεια ύστερα από συζήτηση βάλαμε σε κολλιέ τα προτερήματα του καθενός. Στη συνέχεια είπε το κάθε ένα «ένα καλό λόγο για το διπλανό του»! Γράψαμε τη λέξη «σεβασμός» και ζωγραφίσαμε. Στη γωνιά της γραφής κάθε φορά προσθέτουμε και μία αξία. Τέλος με μουσική αποτυπώσαμε έναν ευτυχισμένο κόσμο!!! Συζητήσαμε τι είναι η υπευθυνότητα ?? να κάνω τη δουλειά μου, να νοιάζομαι, να κάνω ότι καλύτερο μπορώ, να φροντίζω τα πράγματα βοηθώ τους άλλους όταν το έχουν ανάγκη. Εξ’ αιτίας της διαφορετικότητας (που μιλήσαμε μέσα στο Φεβρουάριο) παίξαμε το παιχνίδι «τα μάτια βλέπουν» ένα παιδί είχε κλειστά τα μάτια και το άλλο ήταν ο οδηγός του, μετά μιλήσαμε για τα συναισθήματα τους. Χωρίσαμε τις γωνιές της τάξης σε ομάδες ευθύνης : έτσι η βιβλιοθήκη, το κουκλόσπιτο, τα παιδαγωγικά παιχνίδια, τα μολύβια και οι μαρκαδόροι τα ανέλαβαν διαφορετικές ομάδες παιδιών. Γράψαμε τις ιδέες μας τι μπορούμε να κάνουμε για μια καλύτερη τάξη: να την στολίζουμε με ζωγραφιές, να φυτέψουμε λουλούδια, να αγαπιόμαστε, να μοιραζόμαστε τα πράγματα, να βοηθάμε ο ένας τον άλλο, να περιμένουμε τους άλλους για να φάμε. Γράψαμε τη λέξη «υπευθυνότητα» και ζωγράφισαν το αντικείμενο που είναι ο καθένας υπεύθυνος μέσα στη τάξη. Τέλος φυτέψαμε και όλοι ήταν υπεύθυνοι και για το λουλούδι τους!!!! Areti Foufopoulou, a high school teacher and the Vice-President of ALIVE, holds regular LVE seminars for educators in Athens. On 20 December, she led a seminar titled “Awareness: Its importance to the educational process and life in general”. The main points are below, with links to questionnaires for teachers and students. Awareness is self knowledge … alertness … being in the here and now … mindfulness. Distinguishing awareness at the cognitive level is different from the concepts of mindfulness/spirituality and the Buddhist vacuum. The meaning: knowing my physical state and emotions. Self-esteem, self-control, knowing my strong and weak points. Areti then presented awareness as seen from a few theories of personality. The patient in the therapeutic process is asked to focus on the here and now and the therapist by means of empathy, respect and genuine involvement is called to listen actively to the patient, bringing forward and clarifying problems, fears and obstacles. A helpful process in the school environment; exploring the needs and emotions of the students. Exploration of student self-esteem and attitude towards the educational environment. Which values are related to awareness in the school environment? Lack of awareness in the educational process is the main reason for low participation, lack of limits, ineffectiveness and deviating behavior. Emotions that we bring to the class/school as educators. Joy, relief, satisfaction, justification, anxiety, stress, sorrow, disappointment, depression. Teacher awareness is in direct correlation with student awareness. Development of emotional intelligence/enhancement of self-image. 8 – Action-reaction effectiveness and then what? Goal setting that lies in the search for meaning in learning and life in general. Focus on the here and now of the educational process in regard to broader aims. Working on the ultimate purpose of the educational process. Virginia Satir defines closed and open communication systems. In a Closed System: self-esteem is low; communication is indirect, vague, inscrutable, inconsistent, and growth-preventing; ways are of attack, compromise, reckoning and misleading; rules are outdated, inhuman and unchangeable, individuals change their needs to adapt to set rules and there are restrictions to comments. The result is chaotic, destructive and inappropriate. In an Open System: self-esteem is high; communication is direct, clear, definite, proper and growth-enhancing; ways are direct; rules are clear, modern, human, change when necessary and there is freedom for comments. The result is reality-based, appropriate and creative. A Seminar of "Values, Morality and Wellbeing"
The main subject of the seminar was how values held by students and teachers shape the learning experience and affect the quality of interaction and student performance. There were ten secondary teachers present who contributed their own experiences with students’ ethos and attitudes. They received a questionnaire to answer and take away for their own use with their students. Click here for a copy of the questionnaire. Research shows that morality, or the existence of moral principles and values, is connected with satisfaction and happiness in life because it gives meaning to life and triggers creativity, harmonious relationships and an optimistic outlook. Participants were also given a sheet presenting the main views on morality through the ages – from ancient Greece to modern times. This generated a lively discussion. Finally, the Values Education approach was presented as a bank of ideas and tools to be used in the classroom in order to raise student awareness and promote their understanding and adoption of universal ethical principles. Cooperative writing of a story based on a specific value. Creation of a class climate of acceptance and freedom with limits concerning behavior. Positive reinforcement of solidarity and cooperative behavior. Avoidance of victimization and punishment. Stabilising of rules with consistency and fairness. Allowing for time and space for student expression of feelings. Availability of the teacher for individual discussion with students upon request. In March, an introductory seminar on LVE took place for teachers on Zante. Topics covered strategies for developing a healthy class climate, creating positive self-concepts, building empathy, and implementing values-based discipline to manage the classroom. Participants learned how to introduce values to their classrooms and schools, the importance of parental and community involvement and how to achieve this. Specific tools such as self-observation, self-questioning and self-acceptance as well as the value of silence and visualization, effective use of circle time and reflection points were studied. Another area of emphasis was the importance of switching from ‘reaction’ to ‘action’ through active listening, conflict resolution and role playing following the LVE model. The teachers received information on Daniel Goleman’s Emotional Intelligence as well as his multiple intelligence model. A discussion on the ways interpersonal and intrapersonal emotion intelligence manifest in the classroom, school and society followed. Finally, the impact of the relationship between high emotional intelligence and gender development and gender issues was also investigated. 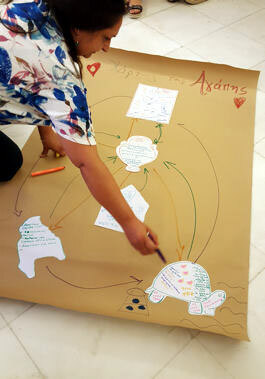 The LVE Team in Greece conducts monthly seminars in Athens and is currently engaged in ongoing LVE Workshops in Zante. Recently a seminar was held in Athens to look at different parameters that contribute to teacher burnout and explore ways to alleviate stress and create a greater sense of wellbeing through personal factors and values education. One aim of the four-hour seminar was to develop awareness of the complexity of the issue, rather than share detailed knowledge of theories. A second aim was to examine how an individual teacher can deal with classroom management, student communication and learning in a constructive way by drawing on her/his own resources – mental, physical, emotional – and applying those despite the number of external factors affecting the job. After discussing causes of teacher burnout and identifying demands of the job, the focus shifted to the importance of values education. This was seen as a means of improving the learning process and communication in the classroom in a deep, holistic way as values education involves individual philosophy and making conscious, informed decisions which gradually lead to personal transformation. What became clear through dialogue and participatory activities was that the responsibility for one's well- being and effectiveness as a teacher lies mostly in inner factors and that systematic work with one's values and goals enhances effectiveness. It was also concluded that self reflection can definitely make a difference. The attendees participated in a warm way, shared freely and became genuinely involved in the activities and discussions. A beautiful self-reflection activity absorbed everyone and participants were reminded of the importance of introducing this to students. The seminar ended with everyone sharing one important reason for wanting to continue being a teacher and/or a personal goal for themselves as a teacher in the future. A new seminar is being planned for this spring. Bullying is a phenomenon related to various personal, social, school, and family parameters and causes. 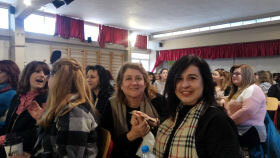 A recent workshop in Athens by the Greek LVE Association looked at physical, emotional, verbal and non-verbal violence in the school environment. Nowadays, the increase in bullying manifests in different ways in the school environment. Related to this is the general deconstruction of principled contexts, confusion about vital social values and the deterioration of moral standards along with an escalation of poverty and unemployment caused by the general economic crisis. During the workshop, different manifestations of bullying at school were identified, possible reasons explored, as well as a view of short and long term effects of bullying on victims. The participants discussed the values of respect, cooperation, tolerance, serenity, awareness, trust, love, honesty, self-confidence, sharing and unity as means to forestall or decrease school violence. Many strategies were suggested for reducing bullying: developing a cooperative classroom climate, having a positive focus on individual differences, meeting the personal needs of the students, enhancing emotional intelligence, setting limits, creating behavioral contracts, using active listening, providing opportunities for student communication and input in planning and goal setting to ensure relevancy. The incorporation of values education into the school curriculum was identified as important. Participants stand, forming a circle while holding hands. They are asked to share one or two weaknesses or dark qualities that caused them insecurity or pain during their school years/whether they were laughed at or bullied for these and how they overcame (if they eventually did) the pain. Participants are asked to reflect on ways in which they were involved in bullying at school or in the family/community, then write short notes of these incidents and share with the team (if they feel comfortable doing so). They are also asked to recall the emotions behind A and B. This brought up very interesting and touching memories. Participants mentioned bullying against/from siblings and this led to a discussion about the way both teachers and parents contribute to the victimization of students/children. Vicky Papadopoulou presented The Box of Emotions. This beautifully decorated box is placed in the class at the beginning of the year and students deposit notes anonymously expressing a feeling related to a school/family or community incident – complaint, satisfaction, joy, sadness … making a short reference to the reason behind it. The teacher collects the papers, transcribes them on the computer and at a certain point in time, returns them at random to the class. Everyone receives one scenario and comments on the incident/feelings. The box can be used to spot bullying incidents if students are asked to write about a person who has harmed them in any way at school or elsewhere and the feelings that this caused. Alexandra Katsaitou was recently introduced to LVE. As Headmistress of a kindergarten school in Kerion, Greece, she shared some values activities on love, peace and friendship that she has used for years. Please click on this file to read about the activities. 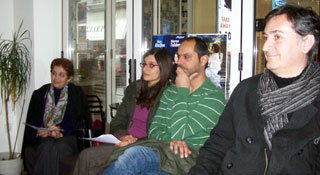 In Athens, the LVE team frequently holds seminars for local educators. Below you will find information contributed by Areti Foufopoulou from two recent seminars, one on bullying and another on values and gender stereotypes. Bullying Seminar: Bullying is a phenomenon related to various personal, social, school, and family parameters and causes. A recent workshop in Athens by the Greek LVE Association looked at physical, emotional, verbal and non-verbal violence in the school environment. 10 Οκτωβρίου Εργαστήριο με θέμα: "Επίλυση συγκρούσεων'' στο βιβλιοπωλείο Παράθυρο στην εκπαίδευση, Μαυρομιχάλη 5 τηλ. 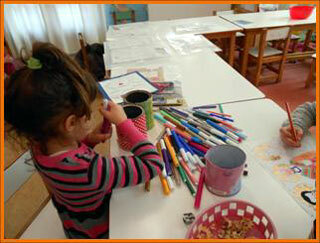 There has been great interest in the Living Values in Education Program in Greece. Our association has been holding two-hour seminars in which we introduce the ALIVE association, present an introduction to the LVEP and, then, conduct LVEP activities on one particular value: October 2007 -"Freedom", November 2007 - "Cooperation", December 2007 - "Respect", January 2008 - "Love" and February 2008, ""Responsibility"". Fortunately, we have been offered hospitality by bookshops with seminar rooms where we hold these workshops. Once our membership grows we will be able to have our own premises. Many educators in Greece are happy and willing to come to two-hour workshops because they often work long hours; we intend to hold a proper LVEP Train-the-Trainers weekend in Fall 2008 so as to offer all a deeper insight into LVEP. Teachers at ten nursery and primary schools are implementing LVE on the island of Chios with the leadership of Sofia Tanaini and other teachers. A child who is able to communicate, express feelings and thoughts, find ways of resolving the conflicts s/he experiences, is much more free to exploit his/ her abilities, and invest his /her energy in creative goals, being at the same time more competent to get over life difficulties. Keeping these thoughts in mind, the ten-school team started the planning of the programme. The first goal was for the teachers of the team to get to know each other and feel the group dynamics themselves with a view to setting common objectives. Then, the differences between the schools and age of students were brought up and there were various suggestions in regard with ways and activities to bring students and teachers closer. This procedure lasted for a whole year and proved to be very important, as communication and feedback invigorated teachers themselves both mentally and emotionally and contributed to the realization of our goals. In the each of the ten schools, one or two teachers are involved with LVE. We hope that in time all the teachers at each school will be involved. To get to know themselves and the world around them in a better way and acquire certain communication skills. To bond together, recognise that each is different, important and unique, explore advantages and disadvantages to cooperation and promote it. To acquire self-knowledge, identify their abilities, desires, traits, appreciate themselves and get recognition from others. To understand that getting older and changing is a process common to living creatures, but different pace-wise for each of us. To explore similarities and differences among people of different teams, realise that differences enrich life and learn how important mutual tolerance and respect are. To understand the importance of effective communication, get training in skills that promote true relationships, control impulse, and get used to getting in each other's position. To learn to control impulsive reactions when under pressure and resolve differences in ways different from those of anger, aggression, and submission. To set realistic personal goals. To learn to evaluate their training and their progress in it. Our common goal was to give emphasis to socialization, verbal expression, a cooperative spirit and team work. Informing and sensitising their family and close environment were first priorities. This meant that we were concerned to get the parents and community involved. Cooperation with local Authorities and organizations not only contributed to the success of the programme but also gave adults the chance to examine their own emotional life as well as that of their children. We applied the different stages of a project for the realization of the LVE programme. As for the work in class, we used techniques of experiential learning since it focuses on children and lets them explore attitudes, values and ideas in a safe, non- threatening way, exchanging experience to their own benefit. The approach had always a holistic, interscientific and subject-based angle, so that most sciences and abilities were taken into account. Various activities were used, based on speech, discussion, communication and exploration. A lot of activities emphasized artistic expression, dramatization and drama games on different subjects. The programme gave both teachers and students the chance to work with imagination, creativity and fun, to get beyond the syllabus and "learn, explore and taste". A systematic evaluation of the programme proved to be a hard procedure, on the one hand because its aims concerned mainly emotional processes and we do not have the suitable tools and sufficient education to reliably comment on the possible emotional changes on the part of the kids, and on the other, because the whole procedure was for us also, an unpredictable journey in the land of emotion and the degree to which we were involved, does not permit us to objectively evaluate what occurred. In general ,we could say that in the part of expressing and handling emotions, the change in the attitude of the children in terms of being able to talk about their feelings was obvious. And in the field of self-image, we saw "low profile" children demand more space and change the pattern of their behaviour with the rest of the children. It is true that such programmes are hard to evaluate, since their results emerge gradually in the future. What became clear, is the necessity of such programmes that address not only the gnostic part but also their emotional world. The programme gave students the chance to ask themselves questions and have fun in an original way. They expressed their feelings, got to know each other, discussed, realised the importance of human relationships and became more competent in handling conflict and delaying gratification. The children started exploring and trusting each other, talked and expressed their preferences, emotions and difficulties they faced. They learnt to respect the rules they set. They discovered hidden abilities and grew more confident. The local community needs initiatives that will promote new values and interests and bring up subjects to discuss and explore. In this framework, the opening of the school to society and the benefit of the impact, brings students and parents closer. Apparently, parents were the immediate recipients of their changes and emotions. In the programme, there was no bad, mediocre or good student. There was the painter, the story-teller, the actor/actress... Self-involved kids overlooked their needs for the benefit of the team. 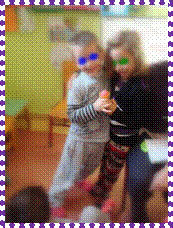 Chidren with learning difficulties surprised everyone with their host of knowledge, vocabulary and drama skills. Children's contact with emotion and its expression by means of their thoughts and desires is an issue of life-long education. However, it's now time to take a first step and realise that emotion is a prevalent element in their life, the key to both a "normal" social life and the conquest of knowledge itself. Only when we as teachers realise that emotional intelligence should have its place in our everyday learning process will children have the chance to live in a school that respects their differences and personal needs. Το όραμα,,θεμελιώδεις αρχές και πρακτικές της Εκπαίδευσης Αξιών �-ωής. Οι Αξίες �-ωής στην εκπαίδευση (LVE) είναι ένας τρόπος θεώρησης της εκπαίδευσης που προωθεί την ανάπτυξη κοινοτήτων για μάθηση βασισμένη σε αξίες και θέτει την αναζήτηση για νόημα και σκοπό στην καρδιά της εκπαίδευσης.Το LVE δίνει έμφαση στην αξία και ακεραιότητα κάθε ατόμου που ασχολείται με την παροχή εκπαίδευσης στο σπίτι , στο σχολείο & την κοινότητα..Με την υιοθέτηση μιας ποιοτικής εκπαίδευσης , το LVE υποστηρίζει την συνολική ανάπτυξη του ατόμου και μία κουλτούρα θετικών αξιών σε κάθε κοινωνία και σε όλο τον κόσμο πιστεύοντας ότι η εκπαίδευση είναι μία σκόπιμη δραστηριότητα με συγκεκριμένους στόχους σχεδιασμένη να βοηθήσει την ανθρωπότητα να ανθίσει. Σχετικά με το περιβάλλον μάθησης & διδασκαλίας. Όταν οι θετικές αξίες και η αναζήτηση νοήματος και σκοπού ,τοποθετούνται στην καρδιά της μάθησης και διδασκαλίας,,η εκπαίδευση η ίδια αποκτά αξία. Η μάθηση ενισχύεται ιδιαίτερα όταν συμβαίνει σε μία κοινότητα μαθησιακή που στηρίζεται στις αξίες και όπου οι αξίες αυτές εκδηλώνονται μέσω μιάς διδασκαλίας με ποιότητα και οι μαθητές διακρίνουν τις συνέπειες που έχουν για τους ίδιους , τους άλλους και τον κόσμο γενικά , τόσο πράξεις που βασίζονται όσο και άλλες που δεν βασίζονται σε αξίες. Για να καταστήσουν ένα μαθησιακό περιβάλλον βασισμένο στις αξίες δυνατό ,οι εκπαιδευτές όχι μόνον απαιτείται να έχουν κατάλληλη διδακτική εκπαίδευση ποιότητας και συνεχιζόμενη επαγγελματική ανάπτυξη , επίσης χρειάζεται να αξιολογούνται θετικά οι ίδιοι , να δέχονται τροφοδότηση και στοργή μέσα στην μαθησιακή κοινότητα. Μέσα στην μαθησιακή κοινότητα τη βασισμένη σε αξίες , θετικές σχέσεις αναπτύσσονται από την φροντίδα που όλοι όσοι εμπλέκονται έχουν ο ένας για τον άλλο. Η ανάπτυξη ενός μαθησιακού περιβάλλοντος βασισμένου σε αξίες, είναι ένα αναπόσπαστο κομμάτι της εκπαίδευσης αξιών και όχι προαιρετικό. Η Εκπαίδευση αξιών δεν είναι μόνον ένα θέμα στο πρόγραμμα . Πρώτιστα , είναι παιδαγωγική.-μία εκπαιδευτική φιλοσοφία και πρακτική που εμπνέει και αναπτύσσει θετικές αξίες στην τάξη.Η διδασκαλία , η βασισμένη σε αξίες και η καθοδηγούμενη αυτοσυγκέντρωση, υποστηρίζουν τη μάθηση σαν μία διαδικασία νοηματοδότησης , συμβάλλοντας στην ανάπτυξη της κριτικής σκέψης , της φαντασίας, της κατανόησης, της αυτογνωσίας, των ενδοπροσωπικών & διαπροσωπικών δεξιοτήτων και του ενδιαφέροντος για τους άλλους. Οι αποτελεσματικοί/ες εκπαιδευτές/ιες αξιών, έχουν επίγνωση των δικών τους σκέψεων , αισθημάτων , στάσεων και συμπεριφοράς και είναι ευαίσθητοι /ες σχετικά με την επίδραση που έχουν αυτά στους άλλους. Ενα πρώτο βήμα στην εκπαίδευση αξιών, είναι για τους δασκάλους/ες να αναπτύξουν μία καθαρή και ακριβή αντίληψη των δικών τους στάσεων,συμπεριφοράς και συναισθηματικής νοημοσύνης σαν ένα βοήθημα για να βιώνουν τις δικές τους αξίες..
Ισως τότε να βοηθήσουν τους εαυτούς τους και ενθαρρύνουν άλλους να ανασύρουν τα καλύτερα στοιχεία από τις δικές τους προσωπικές , πολιτισμικές και κοινωνικές ιδιότητες , κληρονομιά και παραδόσεις. Σχετικά με τη φύση των ατόμων μέσα στον κόσμο και τη θεώρηση της εκπαίδευσης . 9.Στο επίκεντρο της θεώρησης της εκπαίδευσης μέσα στο πλαίσιο των αξιών ζωής,βρίσκεται μία άποψη των προσώπων σαν σκεπτόμενων , αισθανόμενων ολοκληρωμένων ανθρώπινων υπάρξεων με αξία, πολιτισμικά διαφορετικών που ωστόσο αποτελούν μέλη μιας παγκόσμιας οικογένειας.Η εκπαίδευση πρέπει γι αυτό να ασχολείται με την καλή διανοητική συναισθηματική , πνευματική και σωματική κατάσταση των ατόμων. 10. Η θεώρηση της εκπαίδευσης , της σκέψης , του συναισθήματος και της προσφοράς /απονομής αξίας στους άλλους είναι και αναλυτική και ποιητική.Το να εγκαθιδρυθεί ένας διάλογος σχετικά με τις αξίες, μέσα στο πλαίσιο μιας μαθησιακής κοινότητας βασισμένης σε αξίες διευκολύνει μία διαπροσωπική , διαπολιτισμική ανταλλαγή σχετικά με τη σημασία και τα μέσα της εκδήλωσης/εμπέδωσης αξιών στην εκπαίδευση. Επαγγελματικές σειρές μαθημάτων , σεμινάρια και εργαστήρια για δασκάλους και άλλους οι οποίοι εμπλέκονται στην παροχή διδασκαλίας. Διδακτικό υλικό τάξης και άλλους εκπαιδευτικούς πόρους, συγκεκριμένα μία βραβευμένη σειρά πέντε βιβλίων με υλικό που περιέχουν πρακτικές δραστηριότητες, για τις αξίες και μία ποικιλία μεθόδων για χρήση από εκπαιδευτικούς , διευκολυντές, γονείς και παιδαγωγούς για να βοηθήσουν τα παιδιά.και τους νεαρούς ενήλικες να εξερευνήσουν και αναπτύξουν 12 ανθρώπινες αξίες που αναγνωρίζονται οικουμενικά σαν τέτοιες.Η προσέγγιση και το περιεχόμενο των μαθημάτων είναι βιωματικής , συμμετοχικής και ευέλικτης μορφής, αφήνοντας και ενθαρρύνοντας τα υλικά να προσαρμόζονται ,και να συμπληρώνονται ανάλογα με τις διαφορετικές κουλτούρες και κοινωνικές και άλλες συνθήκες.Η προσέγγιση και τα υλικά μπορούν επίσης να χρησιμοποιηθούν συστηματικά σε συμφωνία με τις παραπάνω αρχές με τον όρο «Εκπαιδευτικό Πρόγραμμα Αξιών �-ωής». 2. Συμβουλευτική σε κυβερνήσεις , οργανισμούς , σχολεία , δασκάλους και γονείς σχετικά με τη δημιουργία μαθησιακών πλαισίων βασισμένων σε αξίες και τη διδασκαλία των αξιών. 3.Μία διαλεκτική , πολυγλωσσική ιστοσελίδα (www.livingvalues.net) για χρήση υλικού χωρίς χρέωση. Η προσέγγιση και το υλικό των Αξιών �-ωής χρησιμοποιούνται το τρέχον διάστημα και παράγουν θετικά αποτελέσματα σε σχεδόν 80 χώρες σε περίπου 8.000 εκπαιδευτικά πλαίσια . Ενώ τα περισσότερα από αυτά είναι σχολεία , άλλα είναι κέντρα καθημερινής φροντίδας , κέντρα νεότητας , σύλλογοι γονέων , κέντρα για άστεγα παιδιά, κέντρα υγείας και καταλύματα προσφύγων.Τουλάχιστον ένα μέρος από το υλικό των Αξιών �-ωής LVE είναι διαθέσιμο σε περίπου 30 γλώσσες..Η προσέγγιση είναι μη καθοδηγητική και δίνει τη δυνατότητα στο υλικό και τις στρατηγικές να παρουσιάζονται ανάλογα με τις συνθήκες , τα ενδιαφέροντα των χρηστών και τις ανάγκες των μαθητών. Η εφαρμογή του προγράμματος Αξιών �-ωής συντονίζεται από τον Διεθνή Οργανισμό για τις Αξίες �-ωής στην Εκπαίδευση (ΑLIVE INTERNATIONAL), υποστηρίζεται από την UNESCO και μία πλειάδα άλλων οργανισμών, πρακτορείων, κυβερνητικών σωμάτων, ιδρυμάτων , κοινοτήτων και ατόμων . Αποτελεί μέρος της παγκόσμιας κίνησης για ένα πολιτιστικό περιβάλλον ειρήνης στο πλαίσιο της Διεθνούς δεκαετίας των Ηνωμένων Εθνών για ένα πολιτισμό Ειρήνης και μη βίας για τα παιδιά του κόσμου. To διεθνές πρόγραμμα ALIVE φέρνει κοντά εθνικούς φορείς των Αξιών �-ωής σε διάφορες χώρες και είναι ένας ανεξάρτητος οργανισμός που δεν έχει καμμία συγκεκριμένη ή αποκλειστική ,θρησκευτική , πολιτική ή εθνική σύνδεση ή ενδιαφέρον. "The Munting Nayon Community School in Athens, which is run by the Philippines' Association, has adopted Living Values in their curriculum. Values education already has a place in their education system, but the teachers are particularly happy with the activities that we offer and also the way we go deeper into the values for their own self-development. For the last eighteen months I have been giving training on an ad hoc basis to their teachers, but from September 1999 the principal and teachers decided that they would like me to continue values training with the teachers once a month when they have their teachers' meeting. They are very serious and enthusiastic during these sessions and have a genuine interest to go deeper into the values, what they mean personally and how they can really put them into practice in their everyday lives. There is a refreshing honesty in their desire to learn and to improve. Already we are starting to see changes in the educators themselves and I think this is already visible in the classroom. Formal evaluations have not yet been done, but I will introduce this idea during our next meeting on 28th January 2000. "The title of this two-day event was "Reflections and Directions". On Saturday 16th October, George Mavroudis presented a workshop entitled "How to Create Leaders: The Challenge of Future Education". George explored the skills needed to prioritise properly what to teach and how to teach and asked the question "How do you motivate students to actively participate rather than comply with 'orders'?" He also examined those factors that foster trust in the classroom. On Sunday, as the Living Values Education Coordinator for Greece, I presented a workshop on "Facilitating Learning, Facilitating Language" which took educators through several practical steps, and a process of self-questioning, to identify those areas of the teacher's changing role that can influence the quality of language learned by students. A lot of interest was generated. One participant is a member of the TESOL board and he later emailed to offer cooperation and a venue for future activities in Thessaloniki. 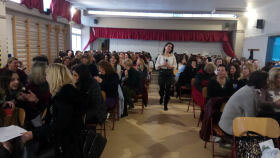 The venue was the University of Macedonia-Thrace in Thessaloniki and the event was attended by about 300 people. "As the Living Values Education Coordinator I was asked to present a workshop in the multimedia section and talked about "The Influence of Technology on Life in the Classroom". I noted that as we move into the new millennium the use of computers and video in classroom teaching is no longer an opportunity but a necessity. In the workshop I showed how technology can have a positive and beneficial influence on the quality of educating our students and how to create the right attitudes towards technology in language teaching and in the creation of an active and positive learning environment. Amongst the participants was a Montessori school teacher with her own school in Kifissia in the northern suburbs of Athens. She was so impressed by the forum and the Living Values Programme that she invited me to give a presentation in her home to a group of parents. Twenty-five people turned up at 8 pm on 19th December 1999 and we left at after midnight! The evening was lively, with 18 very enthusiastic parents who listened attentively to the presentation and then spent 90 minutes firing questions at me about values, how we can teach them to children, how we can model them, etc. As a result, we will have monthly meetings with this parent group starting in January 2000. Living Values gets a new partner! TESOL Greece published my full paper in their July-September quarterly journal. The title: "Learning to Be: A Values-based Approach to Language Learning" had been presented at their 21st Annual Convention in March. They included a synopsis of all twelve values. The journal has a circulation of about 2000."